Fun fact: the human brain processes visuals 60,000 times faster than it does text. No wonder visual marketing is the new buzz in town. It focuses on visual communication with the audience by engaging with them through images, visually appealing content, etc. This is a compelling form of marketing that masters the mechanism of persuasion. It helps one tell a story and emotionally connect with one’s clients. Marketing goals of increasing brand awareness and value are achieved, bringing the organisation closer to their business goals as well. With our attention spans getting shorter, one needs to make sure their product stands out in a person’s memory, encouraging the customer’s buying behaviour by factors of recall and identity. It’s no surprise then that people are investing their time and resources developing tools for visual marketing. Here are some free and flying tools for visual marketing that will help you make your grain shine in the sand! Turn quotes into striking images with ReciteThis.Com. A simple three step process gets the job done: enter quote, choose template, and generate. It produces beautiful images with different fonts, colours, and sizes within seconds after you’ve approved the preview. It allows you to automatically post your quote-as-image to popular sites like Facebook, Twitter, Tumblr, Pinterest, etc. You can also download the image or get it on email. This serves as a quick and easy fix in place of complex capabilities of daunting editing tools. 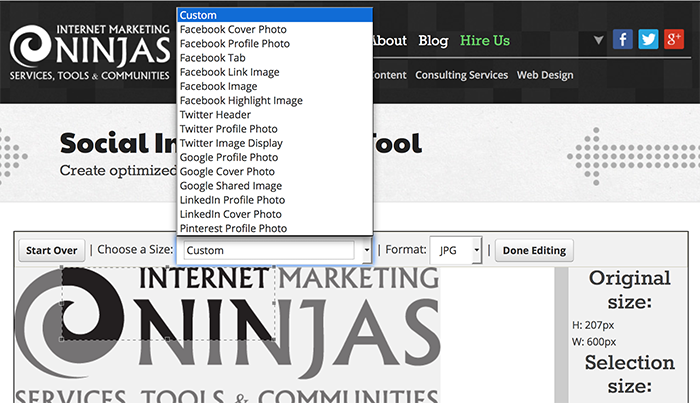 Social Image Resizer Tool allows users to resize content according to different social media sites. Each platform has different image-size requirements. Users are forced to go through complicated editing procedures to make their content compatible with every different size requirement of different social media sites. With Social Media Resizer you can now save time and effort as it automatically resizes your images according to your chosen social media site. It also allows custom sizes and is a breath of fresh air free of cost, logins or any kind of sign up. The number of ads are also considerably lesser. All you have to do is upload file, resize and fill in your email address to have your resized image sent to you, no hassle. This is where you can edit your videos for visual marketing to make it videolicious! This particular editor stands out because of its extensive tutorial library, making the process easier for the common person. It teaches you advanced features like swapping between videos while recording live video. For those who wish to produce professional videos for their marketing campaigns, this tool comes in handy. Videolicious tries to make editing suitable to your needs: you can stick to basics and let them handle your editing for you with set options or delve into their many advanced features to create your perfect video to grab your clients’ attention.